While in India, I was fortunate enough to meet up with Daivisakti, a woman who is my age and who grew up in Cheltenham Township right outside of Philadelphia. Almost 40 years ago, she made the decision to travel to Vrindavan, India to become a member of the Hare Krishna community there. I was the total stranger and she welcomed me with open arms ( and a sari ). She was so very gracious and generous in sharing her time and allowing me to observe and film daily life there. Daivisakti first took me on a walk around the temple grounds. Here there were many people tending to the cows in a gentle way. In Hindu scripture, the cow is held as sacred. Slaughter is prohibited. At one point, she asked me for a few dollars to buy honey treats…being my first time there, I thought this was for us. She came back with a huge bucket filled with a dough in the shape of a balls. The bucket had definitely been through better times and in an instant I was having that age old conversation – do I eat this or how do I not without offending the other???? I was so relieved when she then told me to put it in the palm of my hand for the cows to come and eat!!!! As we walked, we saw women in beautiful silk saris carrying cow dung on their heads while other women were sitting forming patties. I came to learn that cow dung is used as a low cost, effective means of heat. It dries very hard and can be formed into bricks to build small homes. It is burned during religious rituals and used in skin care products and in Ayurvedic medicine. News.discovery.com speaks about the many research projects being done focusing on the medicinal properties of both dung and urine. I was then taken into a building where many products made with cow urine were for sale. Eye drops, shampoo, lotions were just some of the offerings. Being given the glimpse into this community and culture which is far different from my own, was an honor and I found it fascinating. In India, the greeting is, “Namaste” which means the god in me greets the god in you. There are many different paths and many different beliefs to explore that is why travel is so broadening… but in the end, it simply seems to come down to being open to the other, of honoring, respecting and learning each other’s ways. A smile and a bow are known the world over. I am presently in the process of creating a new web site focusing only on the stories and photographs I have taken during my travels. As I was going through tape after tape of footage, I just wanted to share a simple and special story. While in India, I was so fortunate enough to walk beside Amit Chadha who opened amazing doors of adventure for me. One day, he told me he had something planned that he thought I would love and sure enough, he was right! He took me to meet Mr. Chand who was taking black and white portraits of people using the same camera and process his grandfather used. Generation after generation passed down this love and talent, passed down this wooden camera weighing 50 pounds and dating back 150 years. While I was walking/rushing around carrying an assortment of cameras and lenses, here was Mr. Chand with such a peaceful presence… focus, put care and attention into each step and let it all emerge in its own time. He recreated for me that magic that drew me in years ago when I first started with a darkroom in my basement. Photography has come such a long way but for one moment of time, I was privileged to slow down, remember and honor all that came before. The chanting of the mantra, “Hare Krishna” swelling in the temple, goldenrod flowers placed at the feet of dieties, saffron robbed little boys all present a feast for the senses. Spirituality is integral to the identity of India. Several weeks ago, the New York Times covered the Hindu religious festival known as the Kumbh Mela where a, “staggering outpouring of humanity” bathed in the holy waters of the Ganges. Hinduism and Buddhism originated here. After Indonesia, India has the next highest population of Muslims. In this land, Christianity, Jainism, Sikhism and Zoroastrianism also lend their voices and beliefs to this diverse spiritual center. At the very moving memorial to Mahatma Gandhi, the inscription of “He Ram” meaning “Oh God” which is said to be his last words (but with some controversy) are placed at the end of a black marble slab which marks the spot where Gandhi was cremated following his assassination in 1948. Sala is the name given to the formal prayer of Islam. 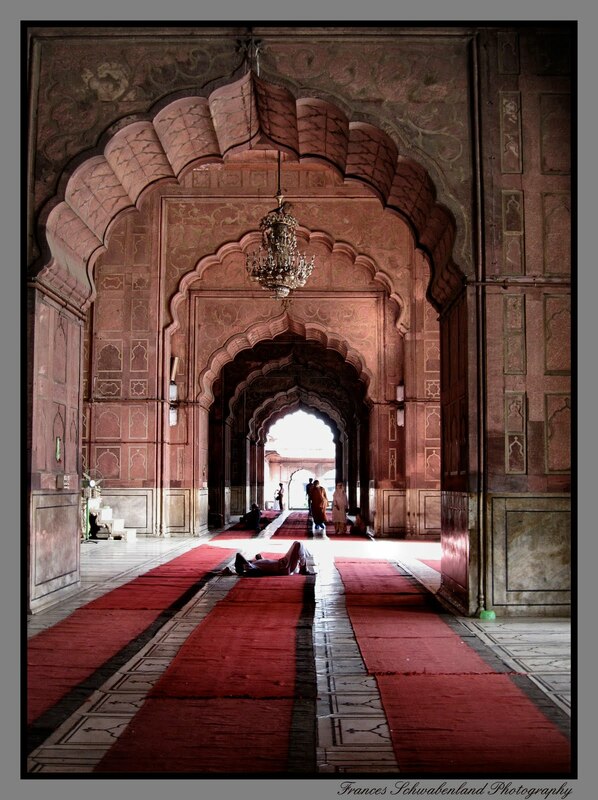 During five periods of the day which are determined by the movement of the sun, devout muslims observe the ritual of bowing down to Allah in formal prayer. 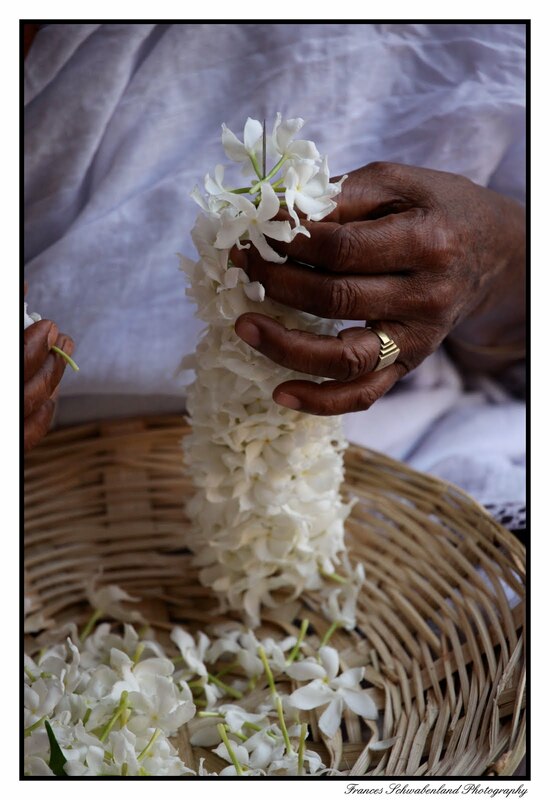 For those practicing Hinduism, flowers serve as an important offering made to the gods. They symbolize the good that has blossomed within. Flowers are placed at the feet of the statue of the deity and this vigraha (image of the deity devoid of ill effects) is showered with flowers. Many different paths with the same purpose to connect and honor. “Namaste” is used by those in India to both greet and say goodbye. The meaning is: The God/Goddess Spirit in me recognizes and honors the God/Goddess Spirit in you. While saying this, one bows to the other. I found this to be such a beautiful way to really be totally with the other person and the Indian people that I met were masters at this! I was a total stranger and yet when I approached someone requesting the take their portrait, I was never turned away but welcomed in. When I travel, I find myself constantly drawn to photograph the people. The camera becomes the connection between hearts and eyes when language fails. Through the lens, I saw incredible beauty and character and we always shared a smile. “Namaste” became much more than a word.I hope you enjoy the video below.